When my husband Fluffy was in college, he took quite an interest in photography. In fact, he took enough photo classes that he ended up with a minor in photography when he graduated. For most of his college years he also worked part-time at the college photo lab, which provided a little extra money and also brought him even closer to the hobby that he loved. One of the things he learned during that time was the art of photo retouching. You don’t hear that term very often these days, it having been replaced with more descriptive terms such as photo manipulation. Retouching was the art of making tiny modifications to the surface of the photograph itself to enhance the subject or to remove imperfections. This was long before digital photography, so the printmaking process was more complex and involved things such as negatives, darkrooms, and chemicals. It seemed that no matter how well you cleaned the negative, there were always dust particles and scratches on it that would appear on the print. So the final step of professional photo production usually involved retouching to remove these small imperfections. After the print was produced, retouching was done with tiny brushes and paints of various colors. Because most prints were in black and white, those were the only colors that were needed, although brown was also included in the retouching kits for handling sepia-colored photos (this is where a brown tint is applied to a black and white photo). Scratches and dust spots would usually appear as light spots on the print, so the retouching was simply a matter of mixing a matching paint color and then covering the light spot with tiny dots of paint. Because a photo is composed of millions of tiny dots anyway, the paint dots added during retouching would not be detected. The basics of retouching could be expanded to improve photos in other ways beyond just imperfections in the negative. Skin wrinkles under the eyes could be removed (always popular with the ladies), as well as reflections in eyeglasses. Radical retouching could be used to remove distracting backgrounds (the ever-popular telephone pole growing from the head), or even entire people (removing the black sheep from the family photo) after a scandalous divorce or crime or other disappointment that was too heinous to be forgiven. 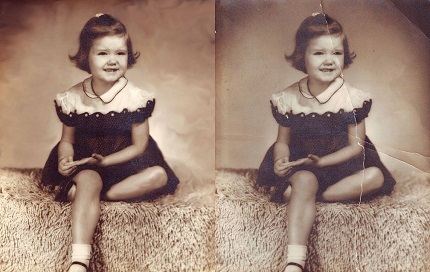 Restoration of damaged photos could also be done via copying and retouching. Damage from folds and stains could be removed, and even missing portions of the photo could be reconstructed. As we fast forward to the digital age, we find that retouching or photo modification is more popular than ever. The tiny brushes and paint patches have been replaced with a computer and photo manipulation software. Fluffy has restored this ancient picture of me. It was actually torn in half, but he put it back together with the magic of PhotoShop. Although this can still be a tedious process, the power of photo manipulation software is amazing. These days, the camera and the captured image is just the first step of the process, with much of the magic taking place after the photos have been transferred to the computer. After we have loaded new photos onto the computer, we examine each one and use editing software to improve them. This may involve straightening the horizon, cropping out unwanted objects, correcting red eye (those zombie-like eyes that people have when you use flash in a dark room), correcting the brightness, contrast, and even the color. In extreme cases, it may even involve removing objects. A few years ago we visited Stonehenge in England. Although Stonehenge looks remote in the pictures, it is actually next to a freeway, and there is a pedestrian path that runs right next to the stone structures. On a busy day, it is almost impossible to get pictures of the rocks without having a bunch of tourists nearby. But not to worry. Fluffy was obscenely patient in waiting for breaks in the crowd. Then the few people he could not avoid were removed with the editing software. 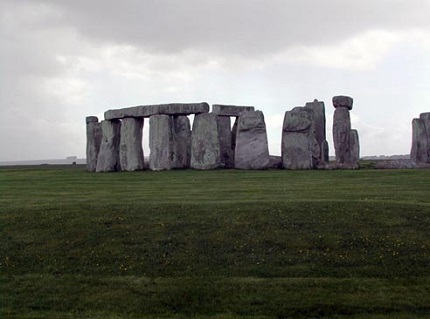 Our photos of Stonehenge would make you think it had been undisturbed for centuries. Here is Stonehenge, minus the pesky tourists. For a number of years I ran a lucrative business providing custom photo portraits of people’s dead pets. People would send me pictures of their dead animals, and I would use PhotoShop to provide “watercolor” images of the pets as a remembrance. In theory, this was an easy proposition. But people would send me pictures of their pet tiger behind a chain link fence and expect me to get rid of the chain link fence. They’d send a picture of the dead hamster after he was dead and expect me to breathe some life into it. They’d send me a picture of half a dog and expect me to put the other half of the dog onto the front half. All this for $14.95 a pop. This took a whole lot of work on my end, but PhotoShop and I usually managed to satisfy the customer. I only wish I still had the Before and After pictures of the two whippets behind the fat guy who was lying on a lawn chair in his bathing suit with a beer can perched on his gut. 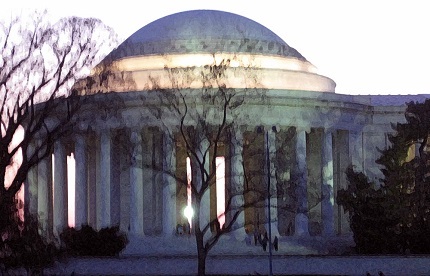 However, I do have a picture I took last month of the Jefferson Memorial. I took it from a moving car so it was blurry. People used to throw their blurry pictures away. Not anymore! Now we can get out the digital software and use the “watercolor” feature to pretend they were supposed to look that way. Voila! Art! Thanks to PhotoShop, I can pretend this picture of the Jefferson Memorial is art and not a picture that should have been thrown away. As I was working on a picture the other day, I was thinking about how Christ is the Master Retoucher of our lives. Just as we use editing software to perfect our photos, He has given us His atonement to perfect our lives. Although we try mightily to be good people, the portraits of our lives are filled with imperfections. Yet He can correct our perspectives, remove distractions, restore the brightness to our eyes, make sure our balance is perfect, and even remove the ugly stains of sin. He can take our rather ordinary lives and turn them into stunning masterpieces. Then we can share that wonderful light with others as we help them enhance the portraits of their own souls. Rarely do you find a photograph that doesn’t benefit from some retouching. And not one of us has lived a life that is free from imperfection. Yet with the help of the Master Retoucher, we can produce a portrait of the human family that is perfect, magnificent, and acceptable to God.